Ferrule/Eraser Color : Choose 1 ferrule and 1 eraser color from the selection shown. 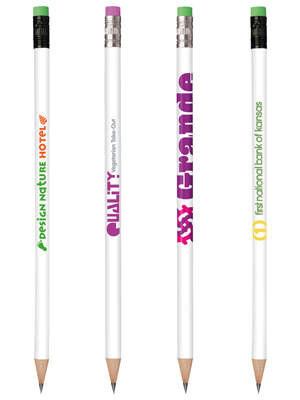 All pencils include a white barrel and #2 graphite lead. Imprint Area: 4" x 3/4"
Color 2: Add $.12 per pencil. For longer imprint life, imprints will be placed toward eraser end of barrel. Sharpening: Add $.02 per pencil. Sharpening may result in lead dust in shipping carton. ground rates. Pencils are shipped unsharpened. Click here for more information.